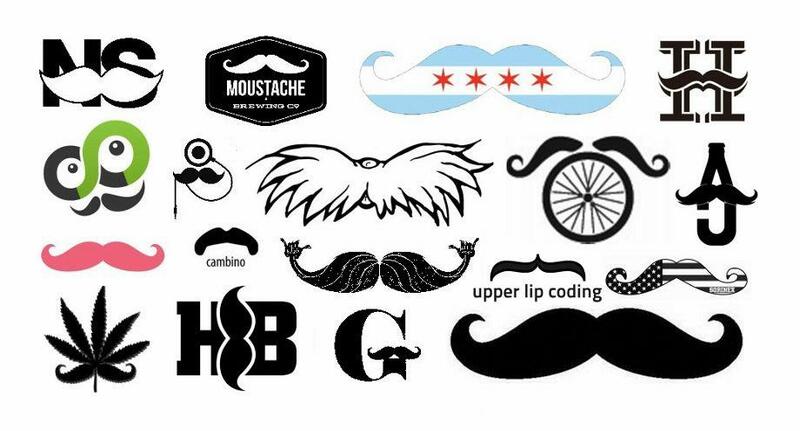 Lyft, hipster finger mustache: Mustache logos are booming. An assortment of American mustache logos registered at the United States Patent and Trademark Office. James I. Bowie is a sociologist at Northern Arizona University whose Emblemetric blog examines patterns and trends in logo design using quantitative analysis of data from the United States Patent and Trademark Office. Here at The Eye, Bowie shares a recent Emblemetric post about the growing use of the mustache in logo design. As November begins, the world’s attention turns to mustaches. In recent years, movements such as Movember and No-Shave November have turned this month into an opportunity for men to raise money for charities concerned with men’s health issues by growing facial hair. The popularity of these events can certainly be tied to the larger trend of men increasingly sporting beards and mustaches. 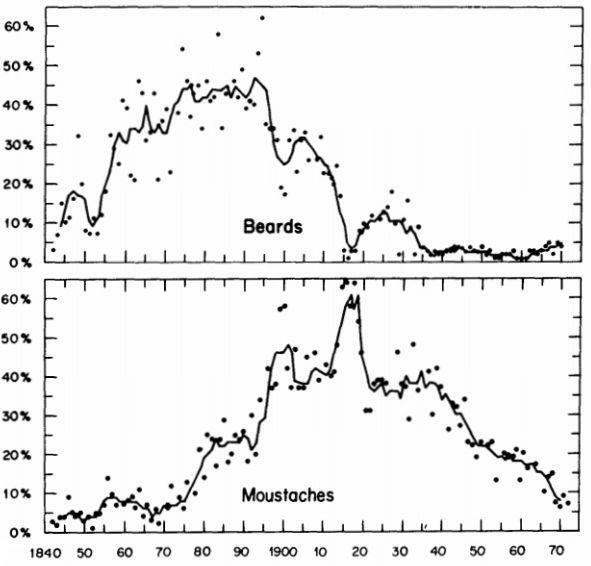 A 1976 study in the American Journal of Sociology found that, although both beards and mustaches had enjoyed periods of popularity among Englishmen over the previous century and a half, both had fallen out of fashion by the 1970s, as illustrated in the graph below. Percentage of men in England with facial hair, 1840-1970. By the late 20th century, facial hair had taken on negative connotations, becoming associated with villainy, stodginess, and deviance. An early 1970s researcher for CBS Television went so far as to say that “there were four leprous castes that viewers would never accept as lead characters: divorced people, Jews, New Yorkers, and men with mustaches.” That line of thinking was soon to be obliterated by shows such as Magnum P.I. Contemporary observation, as well as recent market research, shows that facial hair, whether worn earnestly or ironically, is making a comeback, particularly among younger men. Culturally, facial hair, and the mustache in particular, has taken on a new symbolic presence, one that is reflected in the logos of United States businesses and products. Analysis of data from the U.S. Patent and Trademark Office shows that the percentage of new American logos featuring facial hair of some sort as a design element has shot up over the past decade. Looking back through older U.S. trademarks, it becomes apparent that the way facial hair is used in logos has changed as well. 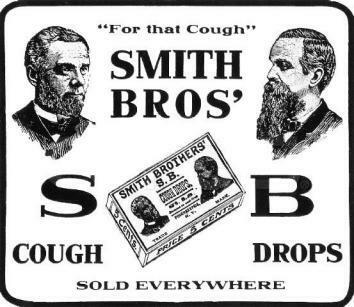 A famous early mark that incorporated facial hair was that of Smith Brothers Cough Drops, featuring portraits of the bearded “Trade” and “Mark” Smith, which was first used in the 1870s. Advertisement for Smith Brothers cough drops, 1914. While not very impressive by modern standards, the Smith Brothers’ mark’s appeal is probably similar to that of Duck Dynasty today: Many people seem enamored by families with abundant beards. The used of bearded and mustachioed trade characters in logos continues to this day. Because facial hair is a particularly distinctive personal characteristic—especially during times when relatively few men have it—it makes an effective design element. Trade characters with facial hair registered with the U.S. Patent and Trademark Office. As logos in general became less realistic and more abstract, the mustache took on the role as a stand-in for a man’s face. When used in conjunction with a hat, a mustache could often represent a man in an abstract way that was consistent with contemporary trends. An assortment of abstract mustache face logos registered with the U.S. Patent and Trademark Office. A related use for mustaches in American logos has been as a somewhat unfortunate and lazy way to communicate Italian or Mexican identity, particularly among marks for restaurants. In these more culturally sensitive times, this trope would seem to be on its way out. “Mexican” and “Italian” mustache logos registered with the United States Patent and Trademark Office. In recent years, the mustache has escaped the confines of the male face to emerge as a stand-alone design element in logos. The “olde-timey” stylized mustache shape, as exemplified by the pink, furry mustaches on the front of Lyft cars; the hipster finger mustache tattoo; and the Lexington Legends minor-league ball cap have become almost ubiquitous, and, dare I say, iconic. From left, Lyft car with furry pink mustache, finger mustache tattoo, Lexington Legends minor-league ballc ap with mustache logo. The beard, on the other hand, while becoming much more prevalent on male faces and in popular culture, has not yet had a big impact in the world of logo design. As a design element, the beard cannot match the mustache’s ability to stand on its own. A selection of American beard logos registered with the U.S. Patent and Trademark Office. Without connection to a face, the beard seems adrift in space, floating disembodied. Perhaps some intrepid designer may be able to solve this problem; the next fortune to be made in graphic design might lie in the harnessing of the symbolic potential of the beard.